I hadn’t heard of Eric Freeze until last year. I suppose this isn’t surprising, what with him being Canadian, ha ha, but for a Mormon with as long a fiction CV as he has, I’m sorry I hadn’t. Plus, he’s an academic who writes about comics and I really needed one more of those back in 2010 when I was finishing up the Sunstone comics issue. Ah well. I’ll know where to turn next time. Dominant Traits is a US reprint by Dufour Editions of Dominant Traits from Oberon Press, the orginal Canadian collection of Freeze’s stories, all but one of which have been previously published in a variety of reputable literary rags. The exception is “Goths”; we’ll talk about it later. The collection is a complex mix, and so I’m going to break this review into pieces. Also, we’re going to try mixing the review with an interview. I’ll end each bit of review in the form of a question. Then get Brother Freeze to reply. I’m not a fan of Spencer’s most famous story and it was, until now, the only Spencer story I’d read. This one (read it now!) I liked more, but I’m still mulling it over, not quite sure what to make of it. The tale is apocalyptic in nature. Earthquakes are threatened, floods are happening (a town’s been wiped off the map; our eponymous hero nearly dives off a washed off road), roofs cave in without warning, wives are kicked out of the house who then leave with dire warnings of the Lord’s return, crazy people execute the innocent, polygamists shoot themselves, deer are dying. The world is ending and everyone is feeling it as the rain falls on the just and unjust alike. Not a bad story for 2012, winkwink. If you know anything about Angela Hallstrom, you should know that she is a person of taste and a keen parser of literariness. And if you followed my Twitter reviews of her new short story collection (archived here–scroll up for the key), then you know that I did not feel equally positive about every story she collected. In fact, some I didn’t really care for at all. But not liking a story in a collection–or even several stories–is a far cry from disliking a collection. This is the third and final entry in this series. The first part of our interview was about Ms Hallstom’s novel-in-stories Bound on Earth. The second was about her editorship of the literary journal Irreantum. 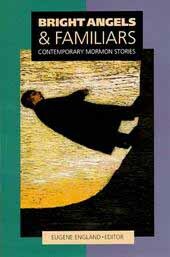 This third portion is about the short-story collection, Dispensation: Latter-day Fiction, that she edited for Zarahemla Books (review).